You would think that with all the reported cases of torture that pirates imparted on their victims you would find at least one account of pirates forcing a victim to walk the plank. There is no primary source evidence of such acts occurring. Of course Howard Pyle provides an excellent painting of the the act and there some dubious second hand accounts of this elaborate execution. Why would a pirate make someone walk the plank? If pirates did force people to walk the plank, the most like reason would be to gain information. Force a person out on a plank and not allow them to return until they provided the information demanded of them. Again there are no historical accounts of such activity until after the Golden Age of Piracy and these are suspect at best. 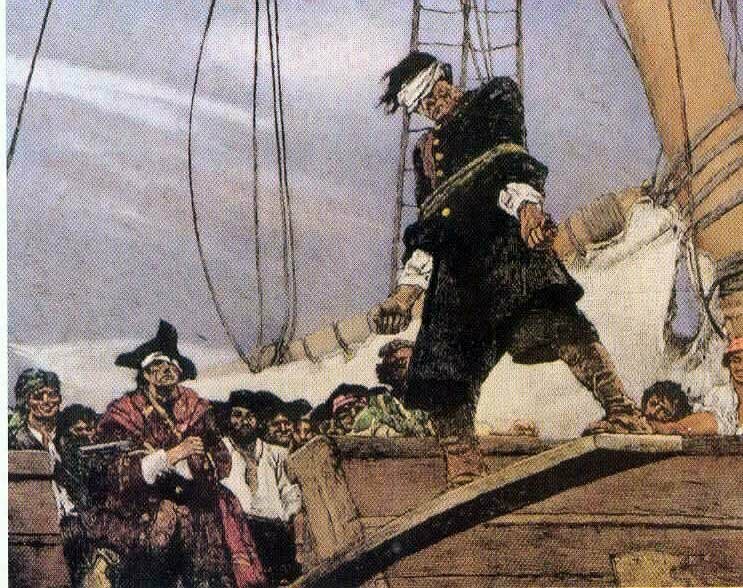 For the most part, walking the plank is a Hollywood myth probably invented because many of the things real pirates did were too violent to get past the censors. There are a few accounts that people were forced to walk the plank by Pirates of the South China Sea. There is also one account that Bartholomew Roberts forced some of his captives to walk the plank and also a claim the Blackbeard forced plank walking. However, none of the accounts are first hand all are suspect at best. On the whole, pirates preferred the time-honored method of a "heave to" when they put a man or woman overboard. That is , they picked up the culprit and simply tossed him/her overboard.